There are an increasing number of mobile users who prefer browsing on apps rather than on mobile websites. This trend has made it necessary for businesses to explore the possibilities of mobile application development. It has naturally become a lucrative proposition for companies to develop e-commerce apps to attract more customers. But developing an e-commerce app is one thing and making it downloadable is quite another. Your job doesn’t get over by simply developing an e-commerce app, you must ensure that thousands are using it. Only when e-commerce solutions are used by a large number of people, can you think of earning huge revenues. 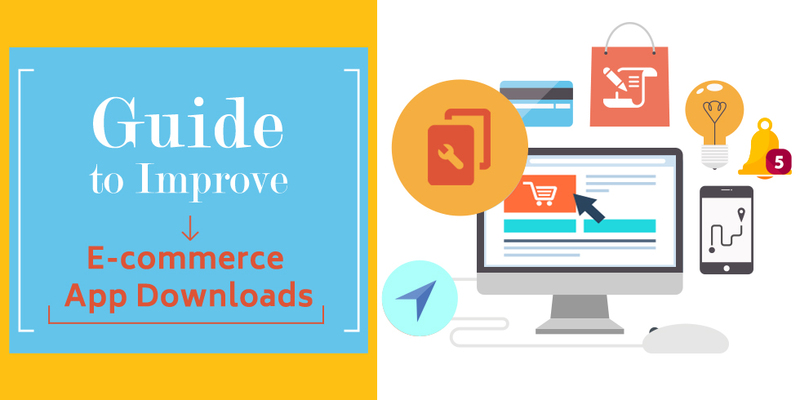 You must concentrate on maximizing your e-commerce app downloads. Read on to know how! The following 7 features and tips will help you in effectively maximizing your e-commerce business ROI. Your first step towards maximizing downloads on your e-commerce app is by ensuring that users are on-board and like what they have in hand. In simple words, your app should be such designed that it can attract a novice app user within seconds. Complicate the entire app browsing experience, and you will see dwindling download figures. Keep the app design simple and have all essential components (like sign-ins and checkouts) right in front of the eyes. The idea behind developing an e-commerce app is to attract more users, and the best way to do so is by making your app user-friendly. If your app rates high on user experience, then you have a winning app. Users should be able to navigate through the app seamlessly, they should be able to personalize it according to their needs, and above all, they should be able to shop without technical glitches. Most e-commerce stores invariably list thousands of products. If you too have a similar inventory, it would be a challenging task to keep navigation simple – but that’s one challenge you must accept and win! While you cannot compromise on the number of products listed on your app, you must opt for a clutter-free design so that navigation is seamless. Users should be able to click on various categories easily and navigate from one category to another seamlessly. You will find very few takers of long registration forms on e-commerce stores. Literally, no one likes to fill up personal details on shopping sites and apps, not only because it’s a time-consuming task, but also because they are quite unnecessary. Similar is the cause for forced social media logins. If you are looking for more acceptance among users, make the registration process simple. Let users sign-up only when they checkout, and let them store the information for later reference. It is a proven fact that push notifications inspire users to take immediate actions on e-commerce apps. Push notifications are also a great way of informing consumers about new deals and offers. If you have launched a new product on the app, notifying users through push notifications is a magnificent idea. Thus when you are sitting with your mCommerce development team, ensure that your app has the push notification feature. It is true that most e-commerce apps have an extensive inventory, but that doesn’t mean you should also follow the trend blindly. If you sell on niche products, crowding the app with unnecessary products will work against you. Also, ensure that you do not have lengthy product description because they look unprofessional. Have only crisp information that informs. Crisp and concise content is one feature that you should definitely opt for. As we talk about incorporating features that make your e-commerce app downloadable, the one thing you cannot forget is analytics. This is one of the core features that will give you an insight into how users are navigating on your app, what is the click-through rate, what is the cost of conversion and finally where is the revenue coming from. Analytics will help you understand how the app is faring and you can accordingly make changes to improve the app. Read Also : Essential Design Elements for Successful eCommerce If you are unhappy with your e-commerce store or are planning to launch a new one, the first thing you need is the contact of a reputable eCommerce Development Company which can meet your requirements. Silver Touch Technologies is your ideal service provider as we have a talented pool of app developers and designers who have the expertise on working for various platforms. Get in touch with us at info@semaphore-software.com.